It’s so tasty, too! 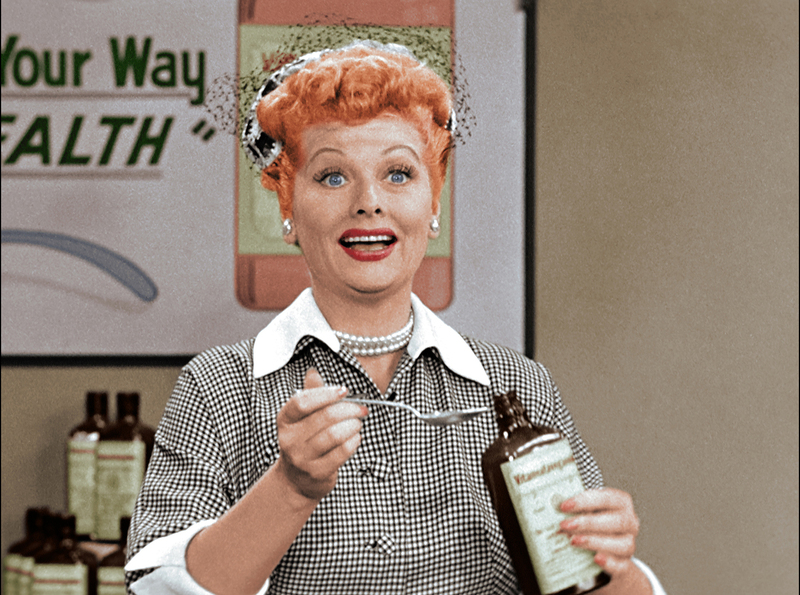 Showbiz hopeful Lucy Ricardo (Lucille Ball) tackles a 23% proof TV commercial gig in the newly colorized classic episode: LUCY DOES A TV COMMERCIAL. Photo ©2015 CBS Broadcasting, Inc.
Do you poop out at parties? Are your Christmas lights in a tangle? Have your Christmas ornaments been pilfered by Fido or Fluffy? 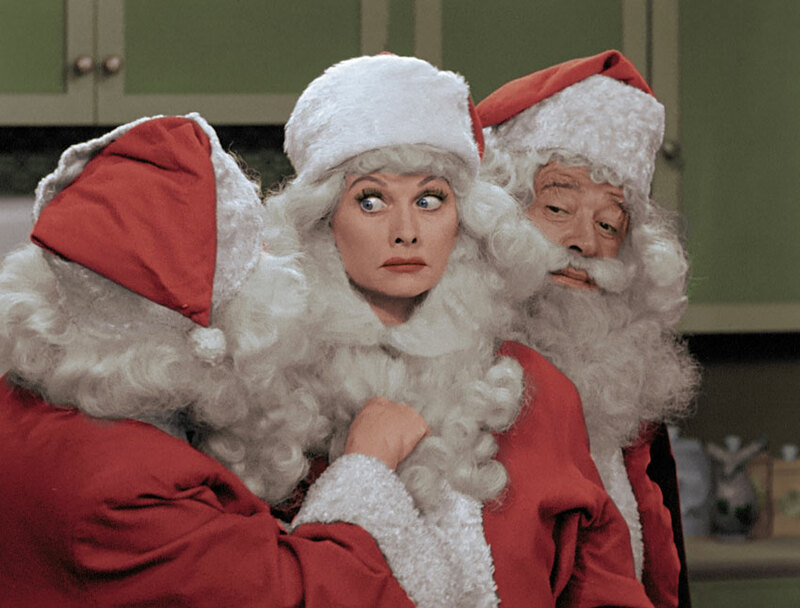 If you’re in dire need of some laughs right about now, I suggest you relax and tune in to CBS tonight, Wednesday, December 23, 2015 (8:00-9:00 p.m., ET/PT) for your annual I Love Lucy holiday fix. As in previous years, the I Love Lucy Christmas Special piggybacks as holiday fare two entertaining, colorized episodes from the beloved 1950s I Love Lucy CBS-TV series. 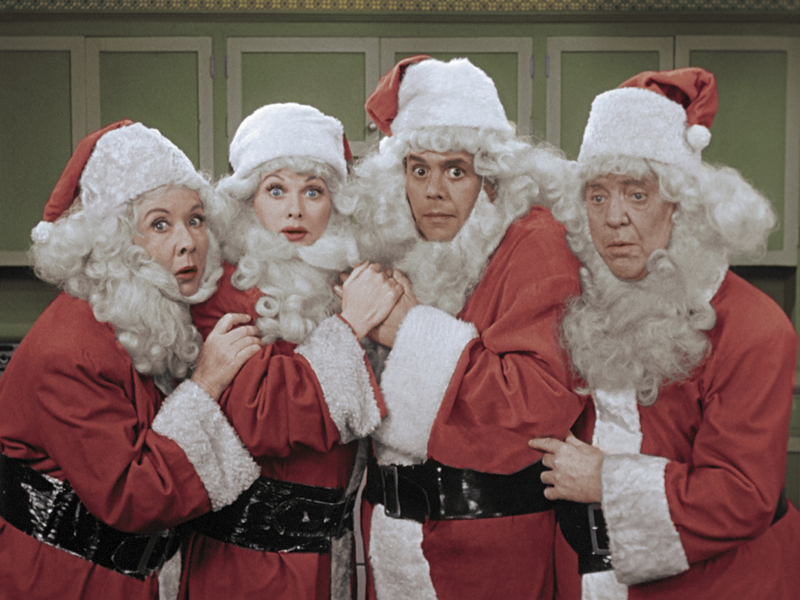 This year, a newly colorized episode, Lucy Does a TV Commercial, debuts in tandem with the previously colorized and aired I Love Lucy Christmas Episode. As every Lucy fan knows, Lucy Ricardo (Lucille Ball) was a relentless showbiz wannabe. Never one to sit idly by while her husband, singer/bandleader Ricky Ricardo (Desi Arnaz), got the gigs, Lucy relentlessly wangled her way onto his shows. Her schemes to sing, act or pirouette her way into Ricky’s spotlight (often aided and abetted by her best friend, Ethel Mertz) triggered memorable comedy shtick. This is especially true in Lucy Does a TV Commercial, which originally debuted as “Vitameatavegamin” on CBS on April 5, 1952. Once again, Lucy ignores Ricky’s orders to steer clear of his show; this time, however, it’s Ricky’s TV variety show debut and there’s an opening for a TV commercial pitch woman. Multiple run-throughs forcing Lucy to swig a 23% proof tonic called “Vitameatavegamin” quickly turn her snappy sales spiel into riotous tongue-tied drivel. Inebriated and dishevelled, she manages to deep-six the commercial and Ricky’s opening number. Lucille Ball’s comic genius is truly in evidence in this classic “Lucy” episode. It’s a comedy gem. Lucy meets the real deal in the I LOVE LUCY CHRISTMAS EPISODE. Photo courtesy CBS Broadcasting, Inc.
Fred and Ethel Mertz join the fun as Lucy and Ricky wistfully recall Lucy’s unexpected pregnancy announcement at Ricky’s club and Ricky, Fred and Ethel’s subsequent foiled effort, months later, to get Lucy to the delivery room on time. Welcome flashbacks are intercut from these classic episodes. The latter, still hilarious after all these years, continues to serve as the classic benchmark for all the derivative TV sit-com “birthing” episodes that followed. How many Santas are too many? Find out in the classic I LOVE LUCY CHRISTMAS EPISODE. Photo ©2013 CBS Broadcasting, Inc. This year, the flashbacks in The Christmas Episode are now colorized as well. Say what you will about colorization (and you can read my thoughts on this in previous I Love Lucy Christmas Special posts), I have since warmed to the process and the team who continue with the “Lucy” colorization project. They’ve definitely managed to impart a fresh, timeless look to the I Love Lucy episodes by sticking with muted, natural tones and without overplaying their hand and resorting to garishness. This entry was posted in TV and tagged CBS, Desi Arnaz, Ethel Mertz, Fred Mertz, I Love Lucy, I Love Lucy Christmas Special, Little Ricky, Lucille Ball, Vitameatavegamin, Vivian Vance. Bookmark the permalink. Well, you could have DVR’d Lucy and still enjoyed Frank and Bing! Merry Christmas!